This flag of modern Okinawa Prefecture, Japan makes an excellent addition to any traditional dojo or home. Approximately 135cm wide by 88.5cm tall. This symbol was adopted as the official government symbol to Okinawa Prefecture in 1972 when reversion gave Okinawa back to the country of Japan. 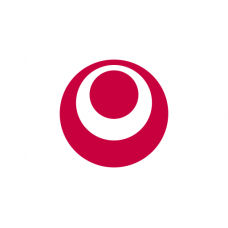 The outer circle of the symbol represents the ocean which plays such a large part in Okinawa's identity. The white circle symbolizes a peace-loving Okinawa and the inner circle symbolizes a globally developing Okinawa. In short, the mark symbolizes "Ocean" "Peace" and "Development" all primary concerns to the people of Okinawa.